HomeBlogHere’s Your 11 Minute, 2017 Text Message Marketing Plan! 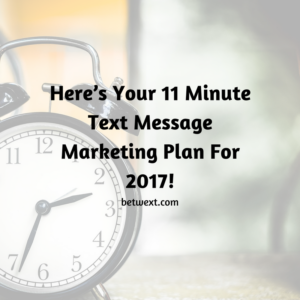 Here’s Your 11 Minute, 2017 Text Message Marketing Plan! Get It Done Right Now – Plan Your Marketing, Then Get Back To More Important Things! This year is already moving faster than any year in recent memory. It seems like we’re being pulled in a million different directions… whether it’s family commitments, support you need to give colleagues, connections you need to make with customers, or important business projects you MUST get done (taxes, financials, that big proposal)! This isn’t going to change. As a small business owner you’re going to be pulled a million different directions at the same time. I’ve been running my own businesses for more than 10 years… and It’s never slowed down! The key to dealing with the constant demands is to find ways to make your job easier… and get ruthlessly efficient at everything you do! Your marketing plan for 2017 should be no exception! A 12 Week Marketing Plan In Just 11 Minutes? Now I’m a big believer in making a plan… then working the plan. It keeps me on track and looking forward. It’s the only way I can get everything done, and not work 27 hours every day! I know if you own or manage your own business you feel the time crunch too. I know this because my most popular article last year wasn’t about the mechanics of text message marketing… or creative ways people are using texting in their business… NOPE. The most popular post was my 10 minute mobile marketing strategy for small businesses! It got more shares than any other article I wrote… and it clearly touched a nerve. So, to give you more of what you want, here’s my updated plan for 2017. Step 1 – The 11 Minute 2017 Text Message Marketing Plan! So, let’s not waste time… let’s get to developing our plan. Take out your favorite note pad, or open up your favorite text editor. Now write. Are they asking about features of your product? Do they want to better understand the quality of your services? Are they asking about the delivery details? Or is it questions about your warranty or guarantee? Jot down 5 or 6 questions… oh, and if you have new customers or prospects… their questions should be at the top of your list. Total time – 2 minutes. Step 2 – The 11 Minute 2017 Text Message Marketing Plan! Step two is easier than step one. Open up your calendar and identify the critical dates you need to pay attention to. March 20th – International Day of Happiness! Now, before you start questioning my sanity, YES, I realize that the last two dates aren’t “Official” holidays. Remember, I’m looking for reasons to text my customers and prospects… and what’s better than an unofficial holiday! Now you’ll make an interesting observation… I’m only looking at the next 3 months. Why? Because I can’t think more than three months ahead… and it gives me flexibility to change up my message quickly if it needs tweaking. I don’t want to plan a year of marketing only to discover nobody cares what I’m saying! So, just focus on the next 90 days. Speed is critical here! How long does step 2 take when designing your 2017 text message marketing plan? Well, 2 minutes if you’re doing it yourself… 10 seconds if you steal the dates I listed above! Step 3 – The 11 Minute 2017 Text Message Marketing Plan! Ask yourself a simple question: What are you trying to accomplish with your text messaging? Are you trying to get people into your store? Are you trying to drive people to your website? Are you trying to sell them a product or service? Are you trying to educate them about who you are? Are you trying to get people to call you? It’s because I want you to think about your call to action. Every marketing message you send needs to have a call to action… and that is tied directly to what action you want your customers to take. So, if you want them to visit your website – make sure to include a link and say CLICK HERE. If you want them to call… make sure to say “Call Now!” and include your number. You’d be surprised how many people forget to include a call to action! Remember, people reading your text messages will only do what you tell them to do… so think about what you want and ask them to do it. Step 4 – The 11 Minute 2017 Text Message Marketing Plan! Don’t worry, the final step isn’t difficult. The final step… mix and match the customer questions with the calendar events and actions you want them to take. Create a quick outline, and in just 11 minutes you’ll have your marketing plan scheduled out for the next 3 months. Week 1 – Send link to blog post to educate prospects. Week 2 – Highlight MLK day event. Send MLK quote. Week 11 – National happiness day – Send Joke in Text! There it is, you have 12 weeks of your marketing strategy planned out and it took you all of 11 minutes. This is probably the fastest you’ve ever done a marketing plan in your life. Trust me, it will work. Now that you’ve got a feel for it, here’s the final step. Final Step – The 11 Minute 2017 Text Message Marketing Plan! The first 11 minutes were getting your marketing plan organized and scheduled. Now you should take the next 19 minutes and actually write your text messages. Don’t check out just yet. Take a few moments and get that plan turned into actual content. It’s not difficult. Remember a text message is at most 160 characters (you can go up to 450 is you send an MMS Message). Look, mobile marketing – especially with text messages – isn’t difficult, you just have to sit down and actually do it! I’ve given you a step by step guide to getting your plan done in just 11 minutes. Start on yours right now. And within a few days you’ll start seeing results! Remember Text message marketing is very powerful tool that you can use to grow customer interaction and sales. Try text message marketing today with Betwext.com.